If TV or radio is part of your day (of course it is! 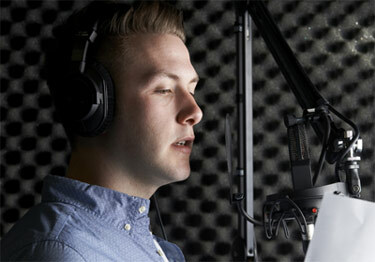 ), then so are voiceovers. From commercials to cartoons, the voiceover professional is somewhere behind the microphone right now, making very good money in a craft that is always seeking new talent. In my career I have recorded voiceovers and jingles for just about every product you can think of, from Ford to Folgers. Now through voiceover training lessons you can be on the road to discovery in the wide-ranging and potentially very financially rewarding voiceover field. My clients receive one-on-one voiceover training and guidance on how to increase their chances of success in this lucrative and enduring industry. It’s not going away, and it seeks new trained voiceover professionals all the time! Have a listen to my voice in these clips from my voiceover portfolio. Contact me to learn more information and hear about my packages and rates.